Tom Armstrong has created, studied, collected, or presented American art to the public for over sixty years. A highly regarded museum professional, he has directed the Abby Aldrich Rockefeller Folk Art Collection, the Pennsylvania Academy of the Fine Arts, the Whitney Museum of American Art, and the Andy Warhol Museum. Armstrong has an equally profound dedication to gardening and garden preservation. He has created an extraordinary seaside garden that is regularly visited by other garden lovers. The loss of his colonial-style home by fire led to its replacement with a beautiful glass-and-steel dwelling designed by Thomas Phifer and Partners. The transparency of this structure creates a reciprocal relationship between house and garden, a merging of interior and exterior. 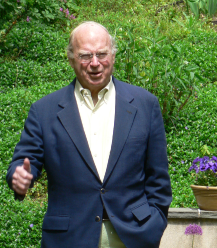 A director of the Garden Conservancy since 1991, Tom Armstrong is the current chairman of the board. He serves on advisory committees at Mount Vernon and Winterthur, and has published and lectured widely on art and gardening.